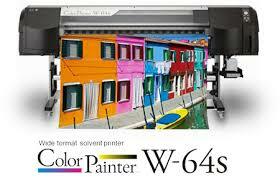 Buy the ColorPainter Wide Format Printer in Upland, CA. While other prints lose density as they go faster due to small drop sizes and low viscosity inks, the new ColorPainter W-64s uses high viscosity inks and an ultra modern piezo-inkjet head to deliver outstanding image quality and no color density loss. OKI’s improved dot pattern enables razor sharp, crisp images at all print modes. Choose between high-production modes with unmatched print speeds, or high-resolution print modes with less grain. Half the world has gone to UV-cured printers. Not because it is the best but because this is what is available (Seiko II in USA now offers a good option for UV via JETRIX). A slowly growing percentage of the world is experimenting with latex ink. As with any ink it has benefits and downsides. A noticeable downside of (HP) latex ink is the lack of color pop and weak color gamut (Mimaki has more color). 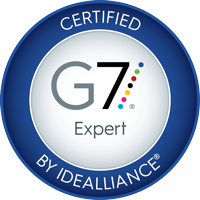 To experience better color for your clients a low/mild solvent ink is a better choice. The ColorPainter M-64s features the new print heads that realize a maximum print speed of 66.5 smph. Guard plates attached the print heads add more reliability and robustness to the ColorPainter M-64s. But now there is an option in the more popular eco-solvent field, resulting from new ink chemistry combined with advanced engineering from Seiko. They now offer a printer with the advantages of low/mild solvent ink (reasonable longevity, color saturation and pop) but with the less odor of eco-solvent ink. So they have the new printer listed as eco-solvent. 5 STARS!!! Great customer service!!! Melanie & Efrain & Joe were absolutely wonderful to work with. They delivered our printer earlier than planned, and went above & beyond what was expected. If you are looking to purchase print equipment, then please call SIGN IT RIGHT, they will take good care of you.